Question of the week: I just installed avast! Anti-Theft on my new Samsung Galaxy S5. If it gets lost or stolen, I know I can use remote control somehow. What do I do to set that up? Congratulations on your cool new phone! It would be awful to lose that! Now that you have the free avast! Anti-Theft installed, you need to set it up so you can use the remote control features to control your phone via the avast! 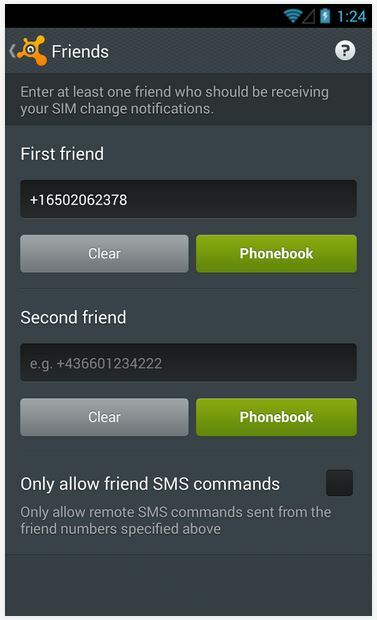 Portal or by SMS commands using a friend's phone. First, make sure you set up an account on our online portal at my.avast.com to communicate with the anti-theft installation. Once you set it up, you get an overview of all your devices protected by avast! security products and you can pair the devices with the online account. To pair your smartphone to the account open avast! Mobile Security, open the Settings section and tap on the avast! Account. The wizard will lead you through the registration or pairing process. Once that's done, you can remotely control your mobile devices on which avast! Mobile Security and Anti-Theft is installed. Another way to communicate with your phone is by SMS commands using a friend's phone. To do that you need to specify one or two phone numbers of friends or family members who will receive the Anti-Theft notifications from your phone. To add a friend’s phone number, open avast! Anti-Theft and click on Friends. You can add one or two phone numbers here. Before you leave the screen, you have one more decision to make: Go to the bottom and check the box Only allow friend commands to allow SMS commands only from the specified friend’s numbers, or, if left unchecked, SMS commands will be accepted from any number. If you change your mind later, you can remove that restriction, by de-selecting the option. Using the SMS commands, you can silently retrieve details of calls made and received, copies of incoming or outgoing SMS messages, you can remotely lock your phone, sound a siren or even remotely wipe your phone of all your personal data if you do not expect to recover it. You can also receive continuous GPS updates so that you can track your phone’s location. Install avast! Mobile Security and Anti-theft from the Google Play store.